The cost of raising kids is a hot topic, and one covered at ad nauseam. Can raising a child really be as expensive as they say – i.e. almost a quarter of a million dollars by the time they hit seventeen? Many stats show that on average parents spend $600-850 per year on just clothing alone for their children. That is ridiculous – even for teenagers! 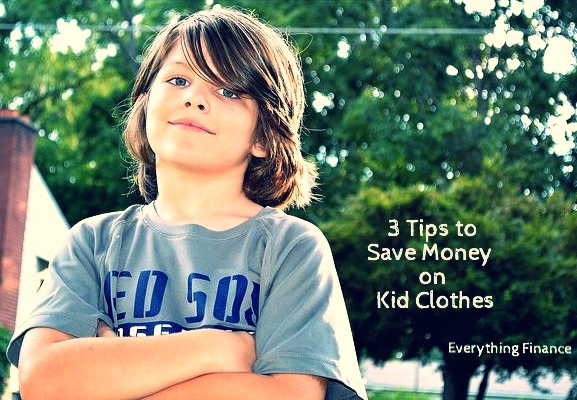 Here are three easy tips to save money on your children’s clothing budget. Just Have Less: This tip goes against the grain, but what if your child (and us, adults, for that matter) just had less clothing? This is definitely easier to get away with if your children are under 8, home schooled, or wear uniforms. Usually around the age of 8 or 9, many kids dress to impress their friends – or at least dress so that they don’t get made fun of. However, if you do have a younger child, try limiting their wardrobe to eight outfits. Of course, you should have a few pairs of pajamas and a special occasion outfit in their closet too. By having less, you have less laundry to do, your kids have more space in their rooms, and you save more money. This may seem extreme to some families, but if you cut your child’s wardrobe size by at least half, I bet you will see an improvement in organization and by how much faster laundry day goes. Buy Second Hand: Most of my toddler’s outfits are hand me downs or bought used. It is nice to be able to buy higher quality fashions, such as Baby Gap, Gymboree, and Converse for what most pay for Walmart brands. If you are picky about what you buy second hand, then you will end up with great pieces that are in good condition even when your child is done using them. I think it is very important to have quality clothing for your children, since they are more cost efficient in the long run. I find it wiser to buy quality brands at used prices than cheap brands at new prices. Let’s be honest; kids are messy. I am much more forgiving and easy going when my toddler completely ruins an adorable Gymboree outfit because I know that I didn’t lose a lot of money (of course, I would prefer for all of her clothes to stay pristine, but I have to be realistic too). Buy Out of Season, Ahead of Time: If used clothing grosses you out, or perhaps it is too hard to find good pieces in your child’s size, then you can still score new clothing for great prices. The main purpose is to shop out of season. This will not work for everyone. For example, my little bug was born in the summer, so I clearly expected her to be in 18 month clothing by the time she was 18 months. Even now at 21 months, she is still in 12 month clothing! So I ended up with a lot of pieces that were never worn. However, I have done this method for Christmas gifts for my nieces and nephews. I shop the after-Christmas clearance of Children’s Place or Gymboree with a big coupon code, free shipping, and Ebates. Last year, I bought clothing gifts for ten kids for $50, or $5 a piece. I enjoyed a stress-free Christmas too. Now that it is March, you might still be able to find greatly discounted fashions leftover from winter at your favorite store. Just buy the size you think your child will be next winter. Chances are if it doesn’t fit, you will be able to gift it to someone you know or sell it for at least the price you paid. Kids grow fast, and it can seem like you are continually shopping for new clothes for them. Try these three tips to save some money on their wardrobes. You should be putting the money into savings for when they are teens and truly care about where their clothes come from.